Carnivorous Plant Newsletter 26: 89-92 (1997). 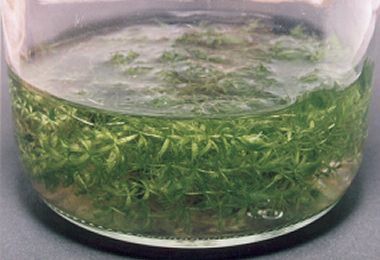 Keywords: conservation: Aldrovanda vesiculosa - cultivation: Aldrovanda vesiculosa, tissue culture. According to the literature, Aldrovanda vesiculosa L. is distributed widely throughout the Old World and Australia (e.g., Diels, 1906; Marchant et al., 1982). But in reality it has become endangered, and some of its local races are extinct. It is extinct in Bangladesh, Denmark, France, Germany, Italy, Japan, and other places. Meanwhile, it is endangered in Poland, Switzerland, and vulnerable in Bulgaria, China, Croatia, the Czech Republic, Hungary, and Russia. Not much information is available for its other sites. Its history in Japan is a fine example of its plight. Japan used to have ten localities of the species, which disappeared one by one. The last Japanese race grown in Houzouji Pond (approximately 3 hectares, or 7.4 acres) in Hanyu City, Saitama Prefecture, has been protected by the Cultural Properties Protection Law #214. As a national natural monument it has been regulated by the Culture Agency of the Ministry of Education, Science, Sports and Culture of Japanese Government since 1966 (Hanyu City Education Commission, 1982; Komiya, 1989). However, in 1966 Typhoon #14 damaged Houzouji Pond. Subsequent eutrophication resulted in the plant's disappearance. This would have resulted in the extinction of the last Japanese Aldrovanda vesiculosa, but fortunately plants were being cultivated by biology clubs of local high schools. The plants were later reintroduced to their so called natural habitat when it was artificially restored. They have since been con­tinuously protected as a national natural monument. In_vitro.jpg: Aldrovanda from E Poland in a standing liquid in-vitro culture, 1998; RK. Aldrovanda vesiculosa in Italy also became extinct and survives only in cultivation (Henriquel, 1997). In Bangladesh Aldrovanda vesiculosa disappeared in monsoon floodwaters prior to 1991 and is now extinct (Khan, 1990; Kondo, 1995). Although Aldrovanda vesiculosa has a wide distribution, little gene flow may occur between populations since its locations are small, well-isolated areas distant from each other. The local races of Aldrovanda vesiculosa must be given much more attention and need to be monitored for conservation. The species has not been listed in CITES Appendices. Can tissue culture save endangered Aldrovanda vesiculosa? Most plants which may reproduce by self fertilization or vegetative reproduction may be easily conserved in the laboratory without any concern for critical population size or genetic diversity, while plants which require cross fertilization may not (Kondo, 1996). The self fertilizing species might eliminate bad or lethal genes during their evolution and might not have inbreeding depression. They could have limited genetic variability. Since the majority of their alleles could be nearly or completely homozygous, these plants need only a few strains per race to be conserved in the laboratory (Kondo, 1996). Even one strain may be sufficient. Aldrovanda vesiculosa is a self fertilizing and vegetatively reproducing species, and thus is an excellent candidate for conservation in a small laboratory space using tissue culture methods. In tissue culture, the shoot primordium, multiple shoot, and somatic embryo methods (without plant hormone supplements) are effective with Aldrovanda. These methods may be useful and safe for micropropagation and gene conservation of inbreeding species. This is because they do not induce genetic mutation in the culture for a long time (nearly 0% aberration in well selected and purified culture cells). In contrast, the callus and cell suspension method (with some plant hormone supplements) may have these problems. Polish race seeds of Aldrovanda vesiculosa (1.0-1.5 mm long, ovoid, with black, smooth seed-coats) were collected and surface-sterilized with 1% (v/v) benzalkonium chloride for five minutes, 1-2% (v/v) sodium hypochlorite solution for five minutes, followed by 70% ethanol for a few seconds. 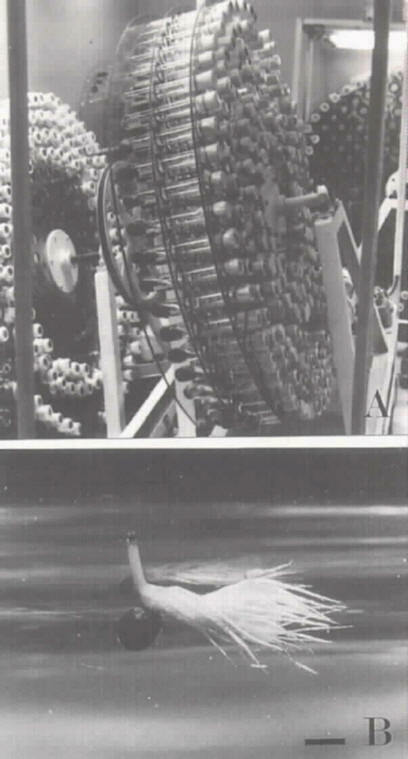 After rinsing in sterilized, distilled water 3-4 times, the seeds were first planted and cultured in Gamborg's B5 liquid medium (Gamborg et al., 1968) supplemented with 2% sucrose, gibberel­lic acid at the final concentration of 20-50 mg l-1, some drops of penicillin and streptomycin at pH 5.5 in flasks for a day for perfect sterilization and to provide germination stimuli. Then, each seed was transplanted and cultured in 25 ml of B5 liquid medium supplemented with 2% sucrose at pH 5.5 in test tubes (30 mm diameter x 200 mm long). The test tubes were shaken at a rate of 2 cycles per minute on a rotary culture apparatus (Figure lA) at 22°C under 2,000-10,000 lux continuous illumination provided by a halogen lamp. After a week or so, 60% of the seeds sown germinated without any contamination by fungi, bacteria or viruses. The germination pattern in the A. vesiculosa seed is documented here for the first time. 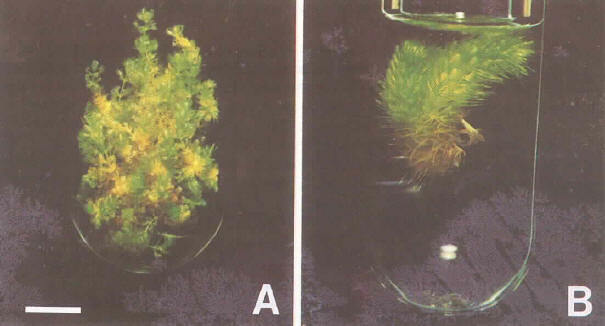 Figure 1: Ex situ conservation of Aldrovanda vesiculosa in the laboratory. A) A rotary culture apparatus provides the necessary environments for axenic and tissue culture. B) Axenic seed germination. An ovoid seed with a black, smooth seed coat germinated with a root which stopped growing when it was less than 1 mm long. It had a red root tip, filiform cotyledons, and true leaves in bud. Bar=1 mm. 1. A root arose from the hilum of the seed and stopped growing when it was less than 1 mm long. The color of the pin-point root tip changed into red. 2. The filiform cotyledons and true leaves were produced, forming a seedling (Figure 1B). 3. The seedling grew to the mature stage. Figure 2: Tissue culture of Aldrovanda vesiculosa in B5 liquid medium. Bar=1 cm. A) Hanyu race. The cultures micropropagate rapidly by multiple shoots, but the shoots are small and slender. B) Polish race. The cultures form a shape like raccoon tails and branch once or twice per month. These two races were different in growth habit, even in the same medium and environment. The Hanyu race of the Japanese Aldrovanda vesiculosa was chosen for this experiment. It was quite difficult to sterilize shoot tips of the Aldrovanda vesiculosa plants in vivo because they contained numerous aquatic microorganisms such as water mold, bacteria, virus and so on in their intercellular spaces. After many sterilization failures of shoot tips, midwinter buds were chosen and their shoot tips were successfully surface-sterilized by the procedure described above for the primary culture. Then, multiple shoots were induced and subcultured in B5 liquid medium supplemented with 2% sucrose at pH 5.5 under the culture environment described above. These multiple shoots became dwarfish and slender and excellent form to fit to small and narrow test tubes. They proliferate so rapidly they fill a 25 ml volume within a month (Figure 2A). At present we have been maintaining more than 2,000 individuals of the Hanyu race. On the other hand, the mature plants of the Polish race were subcultured using in the same method and culture environment described above (Figure 2B). But, they have never differentiated into multiple shoots and never dedifferentiated into shoot primordia or other cultures. The plants continuously grew to form shapes like raccoon tails, and branched once or twice per month. Branched stems were cut, artificially divided and transplanted to other test tubes for propagation. The growth form of the Polish race is quite different from that of the Hanyu race, perhaps due to genetic diversity among the world races. At present we have more than 200 individuals of the Polish race. In vitro cultures of Aldrovanda vesiculosa can be rather easily acclimatized in outdoor environment: they are washed and rinsed well by tap water to remove B5 medium and sucrose before they are placed into tap water for two to three days. Then, they are cultivated in water soaked rice stems (which were first dried) and planted with aquatic plants such as Iris, rushes, and cattails in small containers during the spring season. Aldrovanda vesiculosa is a relict species and is sensitive to acid rain, eutrophication, floods, and other human disturbances. Several local races of the species have already become extinct and more races may disappear soon. Since we find that each race seems to have a different genetic composition, a vigorous race obtained in a site and propagated by tissue culture must be reintroduced to the same locality. It should not be reintroduced to a different site, otherwise the genetic constitution of the world's A. vesiculosa populations would be contaminated. Each race must be separately isolated and tissue cultured to increase the gene bank's genetic diversity. The Laboratory of Plant Chromosome and Gene Stock at Hiroshima University is the nominee for the gene bank of Aldrovanda vesiculosa. Diels, L. 1906, Droseraceae, pp. 136. In: A. Engler, Ed., Das Pflanzenreich, 26 (IV, 112), Verlag Wilhelm Engelmann, Leipzig. Gamborg, O. L., Miller, R. A., and Ojima, K. 1968, Nutrient requirement suspension cultures of soybean root cells, Exp. Cell Res., 50: 151-158. Hanyu City Education Commission, Ed. 1982, Aldrovanda vesiculosa and its habitat (in Japanese). Henriquel, P 1997, private communication. Khan, M. S. 1990, unpublished observations. Komiya, S. 1989, Aldrovanda vesiculosa L. (Droseraceae) and its last natural habitat, Hozoji Pond, Bull. Nippon Dental Univ., General Educ. No. 18: 97-143 (in Japanese). Kondo, K. 1996, Can tissue culture save endangered species of carnivorous plants?, Bull. Australian Carnivorous Plant Soc. 15(3): 9-10. Kondo, K. 1995, unpublished observations. Marchant, N. G., Aston, H. L, and George, A. S. 1982, Droseraceae, pp. 9-66. In: A. S. George, Executive Ed., Flora of Australia, Vol. 8, Australian Govern. Publ. Serv., Canberra, pp. 420. Tanaka, R., Taniguchi, K., Miyagawa, H., Fujishige, I, and Ikeda, H. 1988, Stock of chromosome types and tissue cultured shoot primordium, Journal of the Pharmaceutical Society of Japan, 108: 1023-1039 (in Japanese).